I tried this bread upma suddenly and it took just 10 mts. to finish. Here is the recipe I followed. First cut the bread into small cubes and keep it in the oven for 5 mts. It will become crispier. In the mean time, pre heat oil, splutter mustard seeds and cumin seeds, add onion, tomato and fry it till it becomes golden brown. Add a little water, turmeric powder, salt, red chillies powder, salt and let it cook for few mts. It will become like a thick paste (thokku). Now add the ketchup to it and mix it well. Now put the crispy bread pieces to it and mix it well. Garnish it well with coriander leaves. 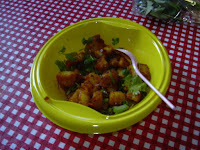 Bread upma looks yumm yumm and Gr8. Never tried till now. Will try now. Super... loooks yummy & crispy with spicy... nice entry... thxs for sharing.. Whenever i make bread upma i feel it becomes very oily in the end.Yours look great and adding ketchup is new..i should definitely give it a try. hi dear, how are you? hmm, the idea of putting the bread pieces in the oven before making the upma is a good idea. 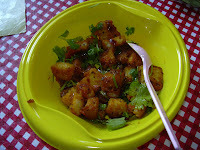 I would be fed up adding so much oil to make it crispy in the traditional bread upma recipe. you haven't picked up ur gift from my blog?? ?